Singapore, 30 October 2017. On a video assignment for WildAsia, videographer Carmen Lin and I arrived at a rustic resort in the southeast coast of Bintan, Indonesia by ferry from Singapore. Walking around the green shrubs, playing fields and coconut palms of the beachside property, LooLa Adventure Resort was what I had thought it to be – an unpretentious ecotraveller’s choice of stay. The winner of a number of awards including the WildAsia Awards in 2012 and Responsible Tourism Awards in 2015 – a rather prestigious award if you’re in the tourism and travel industry – LooLa first took its baby steps in 2000. Beautiful spot in Bintan as seen from the Eco Luxury Chalet at LooLa Adventure Resort. “When we started LooLa the idea was to highlight the natural hospitality of the local people,” said CEO Dr. Marc van Loo, who co-founded the resort with his wife Isabelle Lacoste by purchasing the land from Indonesians (located in the ancient village of Galang Batang) and promptly employing them to build the resort with community building and resource conservation in mind. The locals, always good in word games, also suggested the name LooLa as a contraction of the founders’ names and in honour of a locally famous seashell called the Lula. Climbing a coconut palm for juicy nuts is a popular activity at Loola Adventure Resort. Smiling faces could be seen and laughter heard almost throughout the day as local staff such as Siti Romana guide children and youths through obstacle challenges such as coconut palm climbing (to pluck nuts, why else? ), zipline, skywalk, kayak, raft building and more. It is not often one sees people happy at work! I sensed real passion for warm hospitality and that was because the fundamentals were taken care of – that staffs weren’t just employees, they were also leaders and bosses. The European couple had the idea of creating a self-sustaining resort; one that is run and managed by Bintan residents themselves, including budgeting and hiring of staff, totaling 55. Only the marketing function is being conducted out of Singapore where they and three other Singaporean staffs reside. “Apart from being an instructor, I am also a co-owner of the shop where I learnt how to run it and to manage the accounts,” smiled Romana. The provision shop is well stocked with drinks, snacks and the ice creams (most relished given the hot climate), and the revenues go completely to them. Companies and schools can participate in CSR activities such as improving school's infrastructure. The front porch here has been gravelled thanks to previous such help. “Community engagement has been key from the start and it is part of our business model that the staff and community must benefit. So we do a lot of community work that also benefits the clients and is meaningful for both,” said Dr. van Loo. A range of projects see guests getting involved through the Community Involvement Project (CIP) initiatives for about SGD30 to SGD40 per person (LooLa aims just to recover the direct costs of the CIP projects and does not profit from it). There has been a series of school repairs, painting and various building of infrastructure-related projects. We visited the school; as Lin filmed the facilities and children, I admired the new graveled front porch and fresh coat of paint on the walls. Intent on keeping to the theme of going local and minimising the environmental footprint, LooLa’s chalets are mostly built from wooden materials gotten from local sources. Carpenter Mulyadi showed us a series of furniture that once belonged to the marine world. “We bought discarded boat wood and used that to make window frames, tables and chairs,” said the skilled Indonesian. Harnessing energy from the sun, guests at Loola Adventure Resort enjoy reliable electricity as well as cooled rooms in the night (via melting ice block) at the Luxury Eco Chalets. Other environmental initiatives include the use of solar power – both in the usual and most unusual way. First, the usual. There are 70 photovoltaic (PV) panels of 80kW/hr each that collectively supply 60% of the resort’s power needs. Solar Energy Research Institute of Singapore (SERIS) is a research partner, helping to configure the solar power system to try to optimise their use. 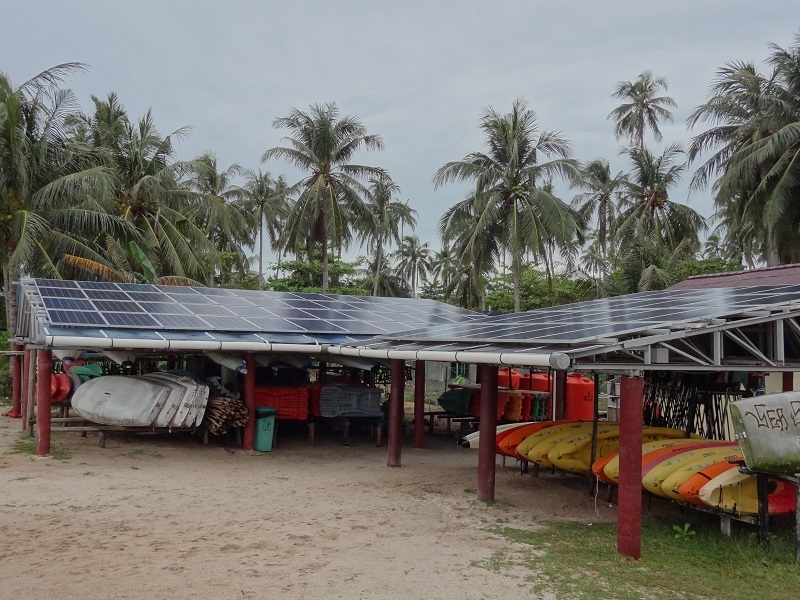 Despite the lack of locally available technical support to attend to a number of issues, LooLa was able to get a return on investment (ROI) of the PV installation in under two years. Now for the unusual. LooLa in 2015 implemented chemical-free, solar-power driven air conditioners in its four Luxury Eco Villas using an ice block. How does this work? The solar energy captured by PV panel is used to power the cooling compressors that freeze a block of ice during the day. This block of ice melts at night, releasing wafts of cool air through the air vents into the villas, helping one to sleep in comfort. According to Elias Ola Purlolon, LooLa’s sustainability manager, this is a world’s first. Marc van Loo: In a sustainable business, everyone wins. To complete the rustic natural feel of the local scene, guests in the other room types such as the six sea chalets and dormitory enjoy sea breeze and an electric fan instead of this air conditioner. Showers are warm thanks to the sun! Apart from energy conservation, water is also regarded as most precious – which it is on an island where people on average make 20 times less money than Singapore citizens yet have to pay 10 to 20 times more for access to ever-dwindling water resources. The resort uses rainwater to supply nearly half of their needs, while it believes that with a bit of tweaking, rainwater could yield well over 80%. Water meters keep track of consumption, while the rainwater harvesting system is currently being adjusted to achieve this target. Rainwater harvesting is a good idea and pays off quicker than one thinks. At Loola Adventure Resort, rainwater is used for a number of purposes and has reduced their bills significantly. “I used to spend over SGD5,000 a year on piped water, whereas my rainwater harvesting systems cost under SGD10,000; data showed that between 80 - 100% of all our water could come from rainwater harvesting, which we are working on soon,” he said, adding that he envisages the ROI of rainwater harvesting could be within a couple of years. But Dr. van Loo is now bent on raising the bar with the water resource to solve a number of environmental and health issues. Clean water and proper sanitation is a priority for Indonesia. Without clean water through proper filtration and treatment, there has been many health and hygiene related issues: an Oct 2016 UNICEF report notes that every day in Indonesia, 370 children under the age of five die as a result of lack of basic water sanitation systems. Keen to help mitigate these problems, Dr. van Loo has been providing water filtration machines as a pilot project in the neighbouring village of Galang Batang. “Bathing their babies in filtered water got rid of the rashes they suffered while providing them with clean drinking water,” related Dr. van Loo , referring to Wateroam’s filtration systems. Travellers can choose to stay at responsible resorts that seek to minimise their environmental footprint such as LooLa Adventure Resort in Bintan, Indonesia. From there, van Loo has gone to a more circular way of thinking in using water as a resource. LooLa has also adopted a biological wastewater processing system, following a UNESCO-approved model (developed in the wake of Aceh tsunami), to recycle water through wastewater gardens. LooLa guests and staff have introduced this Safe Water Gardens to more than 130 households in their neighbouring villages, while the Dutch government provided a grant in 2016 to help a Dutch-Indonesian-Singaporean alliance of top universities to start research into optimising the systems further. Watch the eco practices of LooLa Resort in this WildAsia video produced by Carmen Lin and Mallika Naguran of Gaia Discovery. These gardens solve many health and social problems. Scientific surveys conducted by the university partners show that 70% of the recipients reported that they no longer have diarrhea. The systems are completely maintenance-free following a single but life-long installation. Parents now feel free to let their children play in the garden without worrying that they might get sick due to sewage outflows. The social status is lifted because the house no longer smells bad and mosquitoes are reduced. Best of all, the villagers get a small but highly functional maintenance-free garden that they can use to grow cash crops. The wider environment would also benefit if these systems were to be used on a large scale: other than making people sick from drinking such polluted water from ground wells, nutrient-rich water cause algal blooms in rivers and oceans, that take up oxygen needed for fish and coral health, threatening ocean survival. How does the Safe Water Garden work exactly? The system is made up of a septic tank, a leach field in the form of a garden, and a separate ceramic filter is needed to complete the system. The components of Safe Water Garden that reuses black water to feed cash crops. The wastewater flows from the shower and toilet into the septic tank. Bacteria in the septic tank convert the waste into nutrients. The nutrient-rich water then flows from the septic tank into a horizontal leach pipe with numerous little holes that allow drips or leaches onto a gravel bed. There the roots of the garden plants absorb the nutrients, which could otherwise enter and pollute ground water systems. The gravel bed, coupled with a layer of coarse and porous white sand on top of the gravel, facilitate the efficient uptake of the water, preventing surface flooding. Papaya and banana trees are planted at the Safe Water Garden plot at LooLa Adventure Resort. Photo by Gaia Discovery. “We are still researching the system with the help of universities. The goal is to finetune the existing designs to retain their efficiency while making them cheaper, socially desirable and easy to build. The goal is that all Indonesian villagers can build and maintain the Safe Water Gardens themselves, while taking charge of their own water filtration,” said Dr. van Loo, who is raising funds and calling for collaboration to achieve this vision. Rather than seeking to profit from this venture, Dr. van Loo hopes to mobilize an ever-growing coalition of concerned citizens, educational institutions, businesses and business organization who share the vision and contribute their own passion and expertise to make the vision come to life. Students from Bedok Green Secondary School from Singapore get their hands dirty in building a Safe Water Garden for a family in Bintan, facilitated by LooLa Adventure Resort. To date companies, institutes and organisations that have joined this coalition include Eindhoven University of Technology of The Netherlands (TU/e), Universitas Gadjah Mada in Yogyakarta of Indonesia, the National University of Singapore, Nanyang Technological University, Borouge (committed to demonstrating that plastic can be a force for good), Schneider Asia Pacific (manufacturer of valves and manifolds), Musim Mas Group (palm oil company) and the non-profit Business Council for Sustainable Development Singapore. Selected photos courtesy of Loola Adventure Resort. 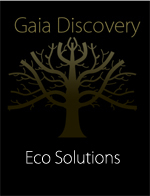 The rest by Gaia Discovery.